I’ve been feeling whiny, needy, insecure, and restless lately. It’s unlike me and horribly unbecoming. I’m taking today to remind myself of my blessings and shake off all those things, people, and situations that push my buttons and “get my goat”! Happy Sunday as you relax and do the same! So cute!!! And I agree… things could be so much worse! It's hard to remember that sometimes when we're struggling. Does that go along the lines of feeling "blah"? Cause I was feeling "blah" this weekend. I did only what I had to around the house and stayed in because it was so humid. Not sure if it was the heat/humidity but I was not interested in doing much. A lot of TV this weekend. Is that at Lake Tobias wildlife Park in Halifax, PA? Thinking of you today and sending a little prayer and hug your way. Hey!!! I am a poet! I know you have a lot on you, but you are right to think about all the blessings you have. As my friend always says, "this too shall pass." Here is one of my favorite Irish blessings that I thought of when I read your post. Well, you have been going through a LOT with your bed bugs, mega-mattress, hubby's job, packing and unpacking, etc… so I can see why. Hope this week is MUCH better for you!! Great attitude! Cute picture. 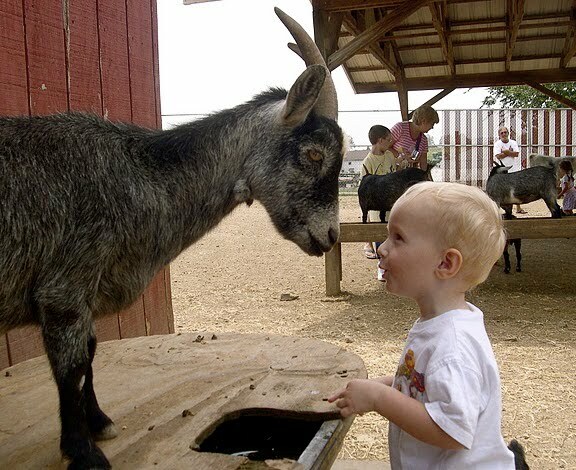 🙂 Goats kinda creep me out a little but my son absolutely loves going in to the petting zoo.